Do you have your Tree Swallow bird houses ready? Now that it is March it won’t be long before they return. If you want to attract them to your yard now is the time to check those nesting boxes and/or clean them out. Okay, they prefer to be near water such as a marsh, meadow, lake or pond (as I have) because they like to eat insects often nabbing them while in flight over water. So unless you have this as a habitat it may be more difficult to attract them to your yard. Have you ever seen a Tree Swallow before? Maybe you have but just didn’t realize what it was. The males are a pretty metallic blue/green with black flight feathers, white breasts, a forked tail, and a tiny bill. The females are more brownish with hints of the blue on them. You may see them darting around going after insects in mid air around water. If you happen to visit local nature parks that have habitats that include lakes, meadows, and marshes you may see Bluebird Houses placed in various locations around the area. Tree Swallows often claim them for themselves so you might easily find one perched on top of one of those nesting boxes during breeding season. This is usually around April. 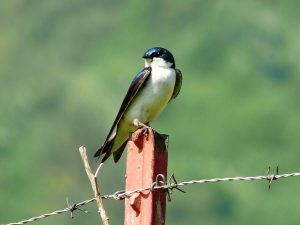 Tree Swallows breed in North America and winter in Mexico, Central America, and the Caribbean. They are one of the earliest birds who migrate back each spring. The males are the first to arrive before females and take a new mate each year. 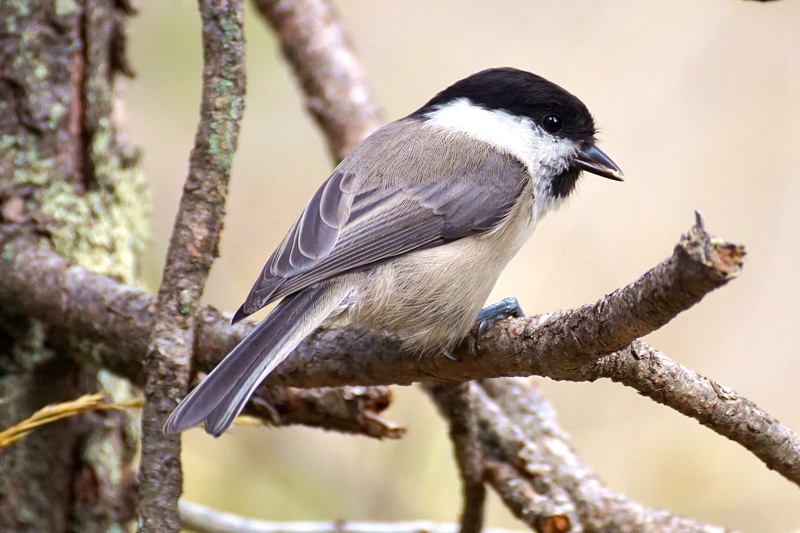 They prefer to nest in cavities such as holes in dead and live trees, and have no problem using nesting boxes. They have also been known to use holes in the ground, or in buildings that are near water. The female builds the nest which is made up of various plant materials such as moss, pine needles, grass, and leaves. She can lay from two to eight eggs and also incubates them which can take from twelve to fifteen days. Both the male and female feed the nestlings who stay in the nest to about twenty two days after hatching. It is definitely fun to watch these birds as they swiftly fly around our yard and over our pond making acrobatic moves as they dip down and catch insects. When these swallows have nestlings they are even more active as they travel back and forth bringing food to the nest. They are also known to dive-bomb you or other predators (even my Yorkie) if you get near their nest. Actually, I have found that they dive bomb you even if you happen to be in their path to get to the insects flying over our pond. No big deal it is just kind of funny when they do it. 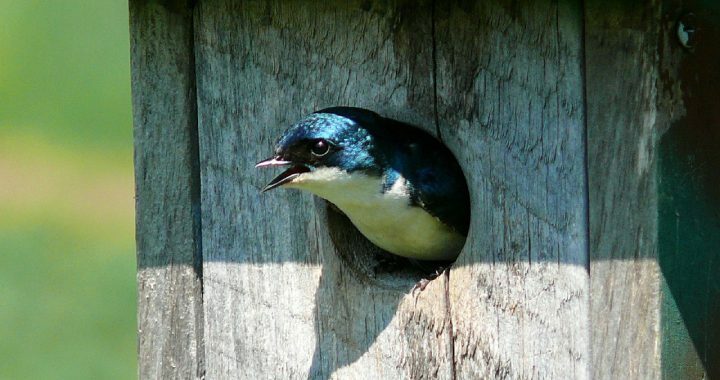 Tree Swallows need a 1 1/2 inch hole for their nesting box without any type of perch on it. No perch means no Starlings or House Sparrows to attract as these birds like perches. The roof should be slanted to keep water from getting in. Bluebird boxes also require a 1 1/2 inch hole and Tree Swallows have been know to use them too as mentioned earlier. Bluebirds are usually found in open meadows and that is a great habitat for the Tree Swallows as well. So keep that in mind. 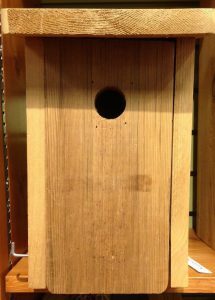 By having two or more nesting boxes placed on your property you may be able to get both species who knows. Nesting boxes should be placed on poles in open fields (as they like open areas). Also consider where they are placed on your property because predators such as raccoons can get to the young as well as some other birds. Ours happens to be up against our house set up high on a shelf which may or may not be the best place for them (according to some experts) but so far has not been problematic for them. Honestly, you just cannot prevent nature from happening….if predators want to get to the birds they will find a way. That is my opinion. Tree Swallows are hardier than other swallows as they will feed on seeds and other berries in colder months. They drink and bathe in flight as they dip down in the water several times. If nest cavities are close together Tree Swallows may nest near other pairs. Tree Swallows eat from dawn to dusk and can eat their body weight in mosquitos. Now that’s a good thing! They do however prefer other insects over mosquitos. Tree Swallows are about five inches long. They gather in large flocks in the fall. They can live 4 to 6 years in the wild. Tree Swallows are always a delight to watch as they make their acrobatic dives to catch insects, and zip around over water. They like to be near ponds, lakes, meadows, marshes, and the like and if the habitat around your property has any of these you will be lucky enough to see them flying around in the sunlight with their iridescent blue/green coloring. These beautiful birds like to nest in cavities and will build their nest in holes of dead or live trees, in the ground, in buildings, and also have no problem using nesting boxes. This may include Bluebird boxes as they both require a 1 1/2 inch entry hole. 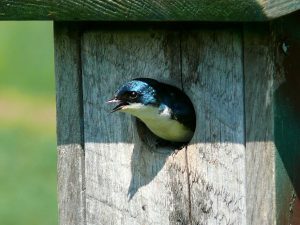 Some people do not appreciate the fact that Tree Swallows take over their Bluebird nesting boxes and if you are one of them then just put up another nesting box and hopefully a Bluebird will move in. Both are very beautiful birds so how can you go wrong? Have you ever seen a Tree Swallow where you live? What do you think about them? I would love to hear from you so don’t hesitate to make a comment below. 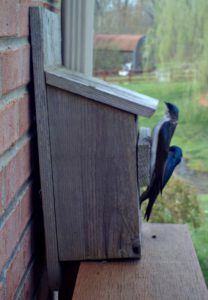 Thank you and ………..
We put up a bluebird box and had tree swallows move in instead! We couldn’t be happier. It’s been a delight watching them and are now enjoying the babies swooping around. Cheryl, I would be happy about that too! Bluebirds are always great to have but the tree swallows are very entertaining for sure. Enjoy! Thanks for your post! We had tree swallows in our bird house in 2016. I didnt clean it out in 2017, but no tenants. I did clean it this spring, but still no tenants! The hole looks a bit ragged so that may have been a factor, but I didnt see any even flying around. I sure hope that their numbers recover–I love their warbly song! Dave, I don’t know that the hole being ragged would stop tree swallows from using the box. I have had the same problem here in Kentucky with tree swallows not using my nesting boxes the last year or two. They started to use one of them this spring and then moved on which could be for any number of reasons. Don’t give up on them you may get them next season as I’m hoping will happen for me. I agree with you, their song and just watching them is great entertainment.